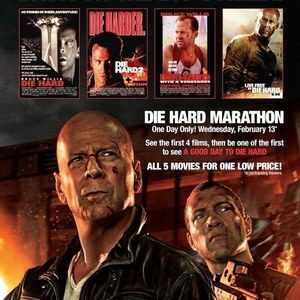 Last week, we reported that 20th Century Fox is unveiling a Die Hard theatrical marathon on Wednesday, February 13, just before A Good Day to Die Hard opens February 14 at 12:01 am. Fans can relive the entire John McClane saga from the very beginning, with Die Hard, Die Hard 2: Die Harder, Die Hard With a Vengeance, and Live Free or Die Hard, leading into the midnight screening of A Good Day to Die Hard. Today, the studio has unveiled a trailer for this massive marathon that will have you screaming "Yippee-ki-yay, motherf&^$er" all day long. You can also check out the poster for this theatrical event.